There is a wonderful story in the October 31, 1986 edition of the Daily Courier News. It discusses The Fabyan Forest Preserve and how Colonel George Fabyan (The Colonel title is honorary) bought a charming old Dutch-type windmill from Louis Reinke for $8,000 and then spent another $70,000 moving and restoring it to its present location along Illinois 25 south of Geneva, Illinois. It would seem logical that the windmill in this postcard is the same one, right? After all, how many 68 foot windmills can there be in the Elgin area?. There is one problem - the story states that the windmill was moved on October 15, 1914 - the postcard above is dated June 29, 1908. I would love to go on record and say that they are the same, but I have had my ears pinned back (figuratively speaking) for reporting facts incorrectly in the past. If you have any information about where if this is The Fabyan Forest Preserve Windmill or some other one, I would appreciate it if you would e-mail me JPMCDunn@aol.com Below is the photo from the newspaper. Kind of hard to tell, with a photocopied picture from microfilm, but they LOOK the same! Let me know what you think! 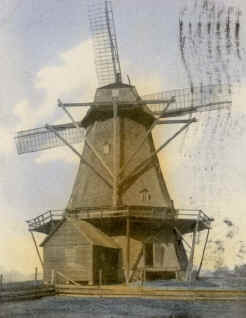 I am a collector of old windmill photos and postcards ... 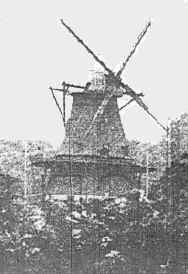 Both mills are very much alike but it is not the same windmill. It is of course possible that the Hinsdale mill was moved to Geneva...and was slightly altered in the process of rebuilding, more windows, new cap? But it is more likely that if the Geneva mill did come from the Lombard/Elmhurst area it was built by the same millwright as the Hinsdale mill. This explains the similarities. Actually, the two are separate windmills; it is just a coincidence that they look alike, but it is known that most of Chicagoland's windmills follow a very similar Dutch-style pattern. The windmill along route 25 in Geneva, IL (popularly known as the Fabyan windmill) actually sat along York Road in Elmhurst before the area was developed. Around the turn of the century when downtown Elmhurst took shape, this mill was relocated to its present location in Geneva (why it was moved so far to the West I do not know). Tom went on to say that "windmill kits" were sent over from Holland, which is one more reason why they looked so much alike - JPM. Fabyan windmill, Fox River, Chicago, reconstruction work much of the mechanism of the Fabyan windmill was shipped to the Netherlands for restoration. During that time, the Walter Daniels Construction Company is renovating the exterior structure back in the USA. Their efforts are is being closely monitored by Dutch millwright Lucas Verbij.